An elderly woman who was killed in a devastating 2-alarm fire in McLean, Virginia, on March 9 was identified Wednesday. A 2-alarm fire devastated a McLean, Virginia, home Saturday, killing an elderly woman who had been missing for hours. 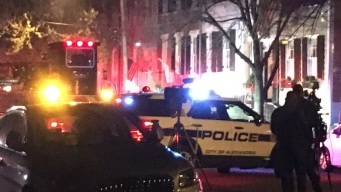 A man has died after a fire burned through a three-story home in Alexandria. 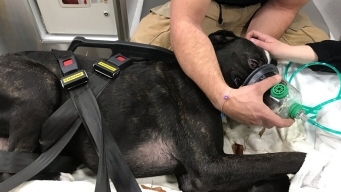 Thanks to some dedicated first responders and a pet-sized oxygen mask, an Arlington dog is safe and recovering after being caught in a house fire that hurt a firefighter. Police arrested two teenagers for allegedly setting fire to a building in Vienna, Virginia, and committed acts of vandalism. One person is dead after a fire ripped through a two-story house in Fairfax County, Virginia, Wednesday morning, though two good Samaritans rushed to try to save the victim. Quick-thinking good Samaritans saved two people from their mangled cars after a fiery crash in Prince William County, Virginia. Arlington County firefighters are responding to a garbage fire. Garbage caught fire near Joint Base Myer-Henderson Hall (aka Fort Myer) and Arlington National Cemetery. 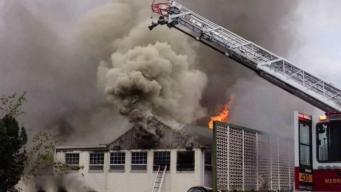 After fire ripped through the roof of a bank in Fairfax, Virginia, last month, a man went in and looted it, according to court documents.